At Dental365, the entire team regards Veterans Day with gratitude and great respect for the work our servicemen and women have done for this country. 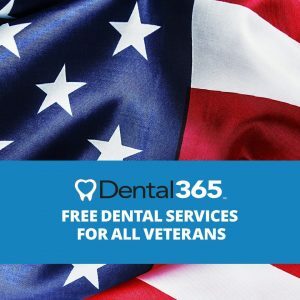 With the growing network of Dental365 offices in the New York metropolitan area, Dental365 is positioned to offer free dentistry to veterans on Veteran's Day, Saturday, November 11th from 9:00 am to 3:00 pm in multiple locations. Services offered will include Cleanings, X-rays, Full-mouth Debridements, and Comprehensive Examinations. The Dental365 locations hosting the event will be in Union Square, Manhattan, Levittown, Long Island and Centereach, Long Island. Getting quality dentistry can be difficult for veterans. In order for veterans to qualify for full Veteran’s Administration dental benefits, they must be completely disabled, have been a prisoner of war or have developed a serious dental condition during their time of service. Fear, money, and lack of dental coverage are all barriers that can keep veterans from getting the proper dental care they need and deserve. Dental365’s goal is to service the communities they are in with the latest technology in oral healthcare and wellness. As an added convenience, their brand new, inviting offices focus on all areas of dentistry, so patients never have to go elsewhere for dental treatment. Dental365 accepts walk-ins with little or no waiting time for adults and children and offers everything from emergency extractions to routine exams, including cosmetic restorations and implants, periodontal procedures and Invisalign all in a state-of-the-art, beautiful environment where patient comfort is a top priority. For more information about Dental365 or to schedule an appointment call 844-365-DENTAL or visit GoDental365.com.